For a little under a decade, the Marvel Cinematic Universe has pretty much been the standard for consistent box office success. Heading into their first major release of 2017 with James Gunn's Guardians of the Galaxy Vol. 2, the viability of the brand is showing absolutely no signs of slowing down. With the early international grosses already coming in for Guardians of the Galaxy Vol. 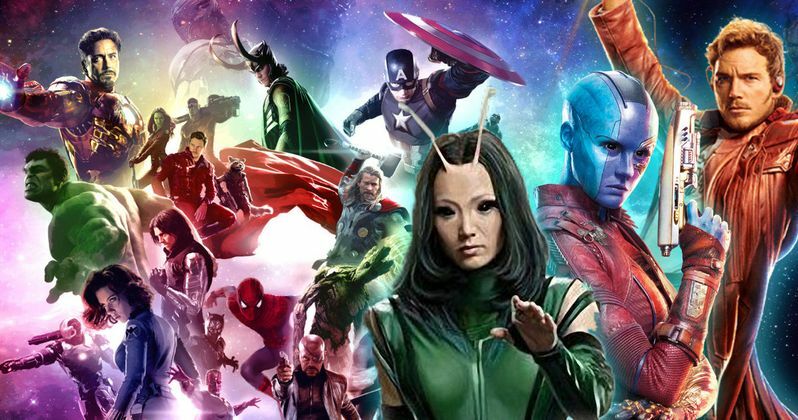 2, the MCU has officially crossed the $11 billion mark at the worldwide box office. According to Box Office Mojo, with Guardians of the Galaxy Vol. 2 bringing in $106 million over the weekend, the MCU worldwide gross now stands at $11.02 billion. Since Guardians of the Galaxy Vol. 2 is expected to absolutely crush it domestically and since it still has a lot of markets to open in, expect that total to go up quite a bit in the very near future. Not to mention that Marvel Studios also has Spider-Man: Homecoming and Thor: Ragnarok set to hit theaters this year as well. Even on the somewhat conservative side of things, the MCU could be looking at crossing the $13 billion mark by the end of 2017. The Marvel Cinematic Universe has had four movies gross more than $1 billion worldwide on their own, which has really helped push the studio to this crazy level of success. Their top earner remains The Avengers, which brought in a truly impressive $1.51 billion in 2012. That is trailed closely by Avengers: Age of Ultron, which managed a haul of $1.4 billion worldwide. The somewhat divisive Iron Man 3 ($1.21 billion) and the much less divisive Captain America: Civil War ($1.15 billion} are the other two movies that have managed to gross $1 billion or more. It wouldn't be at all surprising if Guardians of the Galaxy Vol. 2 or Spider-Man: Homecoming also manage to earn that distinction by the end of their box office runs this year. That $11 billion figure is exactly why every studio in Hollywood is desperately trying to emulate the cinematic universe model and connect a bunch of separate franchises together with some common tissue. This is something that Marvel Studios has done masterfully and nobody else has come close. Yet. Warner Bros. is trying very hard with the DCEU and Universal has their monster movie universe in the works. We'll have to see how that pans out, but for now, Marvel is the gold standard. Part of what helps Marvel so much is that their movies are generally very well-liked by both fans and critics. To that point, even their lowest rated movie, which is currently Thor: The Dark World, still holds a 66 percent approval rating from critics on Rotten Tomatoes. With 15 movies currently in the MCU, counting Guardians of the Galaxy Vol. 2, it is pretty amazing that there isn't a single rotten one in the bunch. When Marvel Studios starts making bad movies, maybe things will start slowing down for them at the box office. But at the moment, there is no reason to believe that is going to happen. The trailers for Spider-Man: Homecoming and Thor: Ragnarok have everyone very excited and with Avengers: Infinity War, Black Panther and Ant-Man and the Wasp coming next year, it doesn't look like Marvel has their risky, possible ball drop in the pipeline.